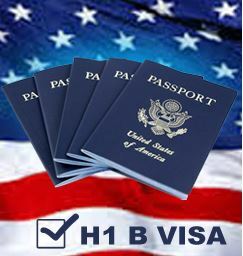 HomeExam-ViewWhat is H1B Visa ? Intensifying its crackdown against H-1B visa abuse, the Donald Trump administration announced a series of steps to prevent fraudulent use of H-1B visas and also issued stern warning to companies against discriminating US workers by over-hiring foreign workers under the visa programme, which is sought mostly by Indian IT firms and professionals. The directions came as the government has started accepting employers’ H-1B visa petitions for the next fiscal year which begins from October 1, 2017. Despite having a Congressional mandate to issue 65,000 H-1 visas in general category and another 20,000 for those who have higher education from US universities, the US Citizenship and Immigration Services has insisted that this visa programme should help US companies recruit highly-skilled foreign nationals when there is shortage of qualified workers in the country. What is H-1B Visa ? It is an employment-based and non-immigrant visa category for temporary workers. The H-1B visa programme permits US companies to temporarily recruit foreign workers in speciality occupations such as science and information technology. Indian IT giants like TCS, Infosys and Wipro are among the major beneficiaries of this programme as they rely on it for bringing in tens of thousands of employees with special skills each year. Among 85,000 H-1B visas issued every year, a sizeable chunk of the applicants are Indians. What all reforms were announced to overhaul the H1B visa programme ? Earlier this year, a legislation was introduced in the US House of Representatives with an aim to overhaul the work visa programme. If passed by majority vote in both houses of Congress, it will be harder for those applying for H-1B visas as it has called for more than doubling the minimum salary of H-1B visa holders to USD 130,000. The move would make it difficult for American companies to use the programme to replace their own employees with foreign workers. Among other things, the bill stipulates that employers should offer a vacant position to an equally or better qualified American worker before seeking an H-1B or L-1 visa holder. It also proposed cancelling 20 per cent of the annually allocated H-1B visas for small and start-up employers in order to ensure that small businesses get an opportunity to compete for high-skilled workers. Were there any changes made in the lottery system for fiscal year 2018 ? The lottery for the next fiscal year has opened without any changes. The unofficial deadline for the Trump administration to enact H-1B visa reform indicates that Trump’s promised reform of the system may be off the table or long delayed. “More oversight is a good start, but employers can still use the program legally to depress wages and replace American workers. That falls short of the promises President Trump made to protect American workers,” Peter Robbio, a spokesman for Numbers USA, a Washington-based group that advocates for limiting immigration into the United States, was quoted as saying by Reuters.